Every spring, all the cowboys and ranchers get together for a time-honored tradition. It happens every year, on probably every ranch throughout America. A day is made of it, and all of the neighbors from near and far have come to help. The wives get together and make a huge dinner, as the men will be hungry by the time they are done with their workday. Today is the day we will brand all the new calves born earlier in the year. I’ve been there as a young man, and I’ve seen how the whole thing works. The men, young and old, wake up before dawn. The first order of business is to herd the cattle into a predetermined pasture on horseback or 4-wheel ATV. In this pasture, other men have constructed a small makeshift corral, made up of a corner of the pasture with barbed wire on two sides and a horse trailer forming the third side. It is protected on the fourth side by a couple of cowpokes on horseback and maybe a pickup truck. This corral is where all the action takes place. The propane-fueled branding iron burner is set up and fired up. The flame shoots into the cylinder like a blue-hot jet engine; its heat can be felt yards away. Three or four irons are put in the fire, so there is always one ready to go. Coolers full of beer are also brought out, and the cowboys are ready for the day. The cattle stick together as the men on horseback rein them in tighter. The men deftly maneuver their mounts around the herd. The cattle are frightened; you can see it in their eyes. 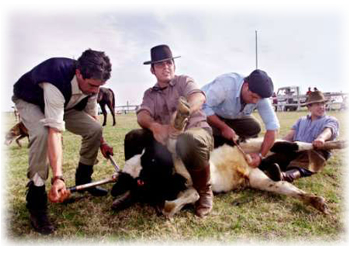 Imagine the mother cow’s horror as she watches a rope wrap around her young son’s leg by one of the men on horseback. The man drags him into the corral, maybe fifty feet, kicking and bleating pathetically. Dragged over dirt, rocks, grass, cactus-whatever’s there. He is helpless, trying to get away, trying to get back to the safety of his mother. Sometimes the mothers go crazy; screaming, kicking and ramming the trailer and the trucks. The calf is in the corral now, and more men on horseback make sure his mother doesn’t get in there with him. Two more men wrestle with the calf as he is dragged in, and he keeps fighting the whole way. He is suddenly flipped violently onto his back, and his front legs are pinned to the ground as one man holds his head and neck. Maybe they think this will calm the calf down. The calf is held spread-eagle, with the other man pushing one leg into the earth with his foot, pulling the other one up in the air with both strong hands. The man’s other foot is jammed into the flank of the calf’s other leg, holding it steady so the calf won’t flinch when the time comes. 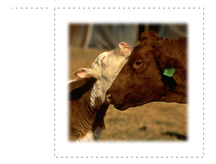 At this point, the calf is completely immobilized. Once he is exhausted from fighting his captors, he lays still for a minute or two and tries to catch his breath. All of a sudden, from out of nowhere another man appears. He is holding a literally red-hot branding iron, and he’s ready to use it. The men holding the calf brace themselves. 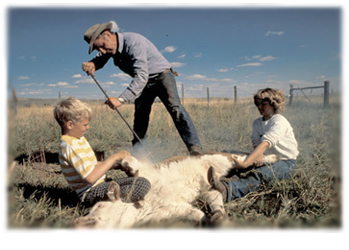 On the brander’s signal, the iron is pushed into the calf’s hip, and smoke rises from the burning hair and flesh. The smell is nauseating. A small flame rises off of his skin, and slowly burns out. 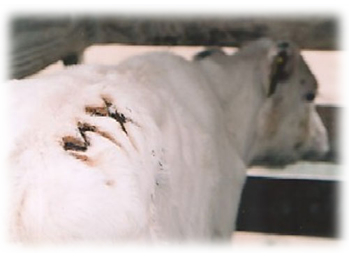 All the while, the calf is kicking and screaming his heart out, no doubt wondering what he did to deserve this torture. The cowboys hold tight. If the calf moves, or flinches, the man may have to go in for a second try. Then, when it can’t get any worse, another man appears. Physically exhausted at this point, the calf has almost no fight left. Now comes the dangerous part, dangerous for the cowboy walking up with the knife that is. The old trusty and rusty pocketknife he carries with him everywhere he goes. The man reaches down to the calf’s groin, stretching the testicles to the limits of the sac. Before the calf knows what’s happening, his testicles are gone with one swipe of the dull knife. No anesthesia, no numbing, just gone. Blood trickles out, and an entry point for infection has been created. Hopefully the vaccination that was administered through a huge needle by another cowboy during this whole ordeal will take care of any infections. And less than five minutes after the whole ordeal started, the men’s work with this calf is done. The calf is carefully let up, visibly dazed. Hearing his mother’s cries, he runs out of the corral and back to her, his hip still smoking and blood dripping from his groin. The cowboys chalk up another one and throw the “Rocky Mountain Oysters” on a flat part of the branding iron cylinder. They cook them up right there in the corral, munching on them throughout the day and sloshing them back with a beer. The men can’t linger long, though, as another calf is being dragged into the corral, kicking and screaming for his mother.